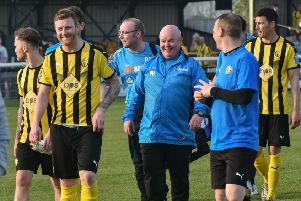 Leamington boss Paul Holleran believes his side’s hectic run-in finally caught up with them in the second half of their play-off final defeat to Hungerford Town. Brakes led 1-0 at the interval at Buplit Lane but dreams of an instant return to the Conference North were shattered as Hungerford took advantage of the fading visitors to score twice in the second half. And, following on from a succession of high-stakes games for his side, Holleran said it was 45 minutes too far for his brave troops. “I think the last month of the season caught up with us,” said Holleran. “The character we showed to come back against Cirencester, to get a result at home to Hungerford and then the Redditch performance and result - we’ve shown so much spirit and character. “The players cannot be faulted for guts and determination, they give you everything. “We’ve had to play with players patched up and cope with injuries - the game on Monday was crying out for Joe Magunda. “The schedule is so hard and we’ve never come up short. “We’ve always put a shift in but on Monday we just faded. “The conditions and the pitch didn’t help us and there were tired legs and tired minds. Brakes were backed by a 500-strong army of fans in Berkshire, turning the cramped ground into a sea of gold and black. And after a similarly impressive turnout at Redditch five days earlier, Holleran said not being able to deliver on the promotion dream was a bitter pill to swallow. “The fans have driven us on and you can see that special bond between the fans and the players.